Question: Being a college professor, I have a good circle of friends. Most of them are worldly people and talk only about worldly things. How should I deal with them? Amma: Try to talk less with them and even then, only if necessary. When they see that you are no longer interested in the things that they are, they will slowly avoid you. Don’t think that they will get angry with you. Let all of them hate you if they wish. Don’t go towards things which will again create trouble for you. You should go towards stillness. Our time is precious. It is not to be wasted by the company of others. Whatever time you have, you should be more introspective. Many of the friends come only to gossip and chat, don’t they? Lovingly tell them, “We have been talking for a long time. What are we going to gain by talking about and discussing all these things? My goal is to think about God, to give solitude to the mind. You might get angry with me if you don’t like it. At present, that is not a problem for me. I can move forward only if I overcome obstacles. I am not angry with you, even if you get angry with me, for I have only love for you. But now I don’t have any time to waste.” Saying so in a very calm and loving tone, you should withdraw into solitude. Let them love or hate you. Some such control is needed in the beginning. “The first thing parents should attend to is the character of their children. They should teach them good behaviour, and this means instructing them in spiritual matters. The parents should tell their children stories that teach moral principles, and they should train them to do japa and meditation. 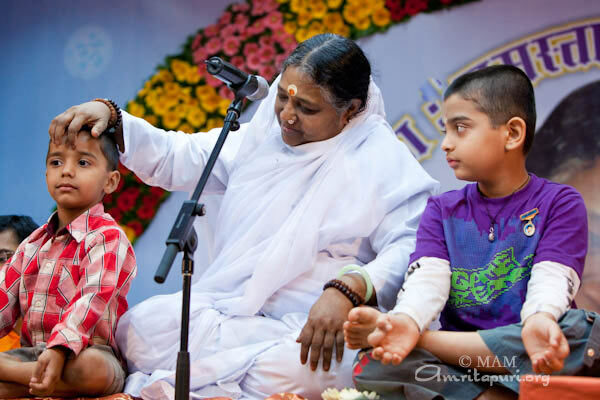 By doing sadhana (spiritual practices), the intelligence and memory of the child will greatly improve. They will also be well behaved. They will progress spiritually and will also be materially successful in life.